Oh my goodness. 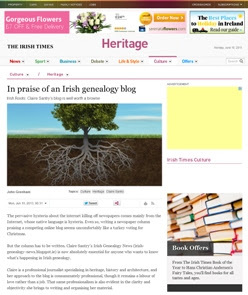 John Grenham, aka the Godfather of Irish Genealogy, has chosen to make this blog the focus of his weekly Irish Roots column, published in the Irish Times today. And he's been incredibly positive about it, too. I'm stunned. I'm delighted. I'm blushing so hard I look as though I'm wearing an 'Aran Tan'. Being unaccustomed to praise and more comfortable at the back of the room, I'm at a bit of a loss on how to properly respond. So I'll just say a heart-felt Thank You to John, for his kind words and his huge generosity of spirit.